These are some of the guidelines manufacturers, distributors, retailers, & the vapor industry are trying to fully comprhend and comply with. 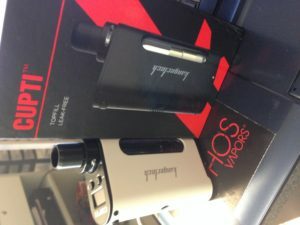 The Cupti by Kangertech is and all in one device. This is Kanger’s second run at an all in one device and I think they nailed it this time. With its leak proof design and a battery door that is much more user friendly than the Nebox this mod takes the cake. The Cupti holds 5ml of juice and runs up to 75 watts, also featuring temp control, the mod comes with one .5 ohm coil and a 1.5 ohm nichrome coil for mouth to lung vapers. Overall they made many upgrades compaired to the Nebox and to me is a much better all in one device.